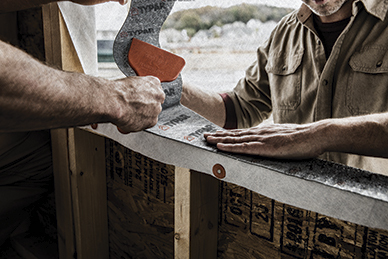 After steel and wood, concrete is one of the most common types of decks specified in the roofing industry. 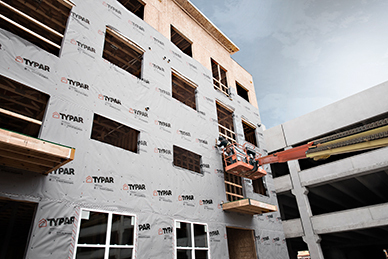 The material makes up 13 to 14 percent of the new and retrofit low-slope construction market, according to the National Roofing Contractors Association (NRCA) 2015−2016 Market Survey. However, challenges related to moisture still persist. When a normal-weight structural concrete roof deck is poured (i.e. cast) in place, it contains a high level of water. However, when a lightweight structural concrete (LWSC) roof deck is poured in place, it uses significantly more water. The normal-weight concrete employs standard aggregates (i.e. hard rocks) with a low water absorption rate, and weighs approximately 2403 kg/m3 (150 lb/cf). LWSC employs shales and clays expanded with air to make them less dense, and weighs approximately 1922 kg/m3 (120 lb/cf). This means that LWSC absorbs significantly more water than normal-weight decks because of the different aggregates used. Just because LWSC is ‘lighter’ in terms of overall weight does not mean it absorbs less water. 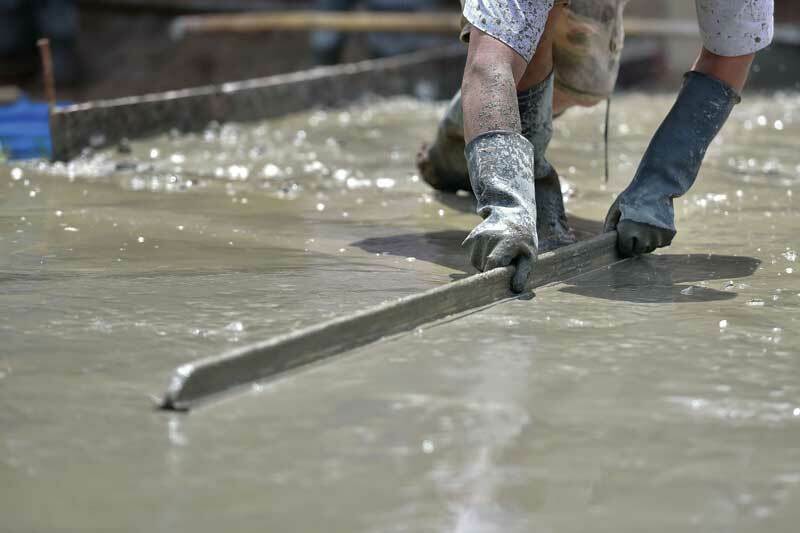 Regardless of concrete type, additional water is often added to the mix to reduce viscosity and ensure concrete flows easily so there are no gaps or voids in the final product. Since concrete is made with aggregate that is often stored outdoors and uncovered, there can be water within the aggregate that goes into the concrete, again adding to the overall quantity of water in the mix. Traditional structural concrete aggregates normally have low water content, while LWSC aggregate is intentionally loaded with water because of the voids. This is necessary so the water needed for hydration is not pulled into the voids in the LWSC aggregate. Beyond the lower weight, LWSC’s advantages include less cracking and shrinking. The material may also have a better fire rating per unit of thickness depending on the classifications being used. The reduced density relative to normal-weight concrete also means the material’s transportation and handling costs are lowered, therefore reducing overall energy consumption. Use of LWSC can also help a project garner points under the Leadership in Energy and Environmental Design (LEED) green building rating program. Consequently, use of LWSC has increased over the past decade. 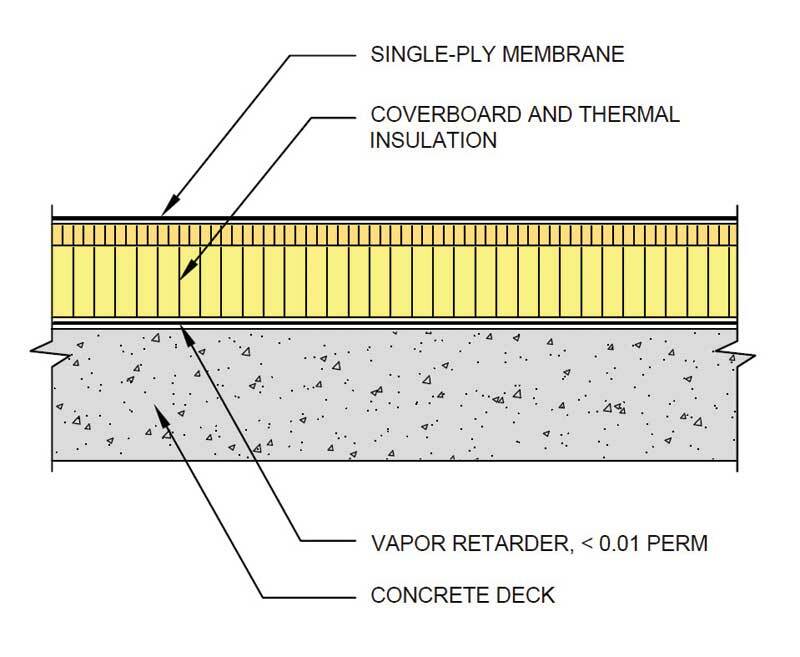 The Midwest Roofing Contractors Association (MRCA) is advising a vapor retarder of less than 0.01 perm is necessary over new concrete roof decks. 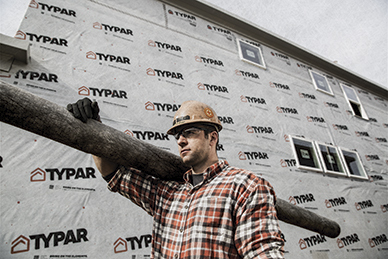 From a practical standpoint, a vapor retarder of less than 0.01 perm is effectively a vapor barrier—almost no moisture passes through to the roof system above. This method is shown in the image above. Typically the roofing industry has required a 28-day curing period prior to testing the deck for ‘dryness’ and suitability for roofing. This suggested length of time comes not from NRCA, but was garnered from the concrete industry’s recommendation for the appropriate amount of time for concrete to cure and develop adequate compressive strength. However, the 28-day time frame is not related to the amount of water in the concrete—only to the cure time. The roofing industry now understands concrete continues to cure and releases excess moisture (i.e. dries out) for a significant time. It is important to note LWSC’s higher moisture content relative to normal-weight concrete means a much longer drying time is needed. When a concrete deck is poured, some of the mix water is used up in chemical hydrations as the concrete cures, and some evaporates. Nevertheless, the rate of evaporation is slow, so large quantities of water remain stored within the structure of the concrete for extended periods. 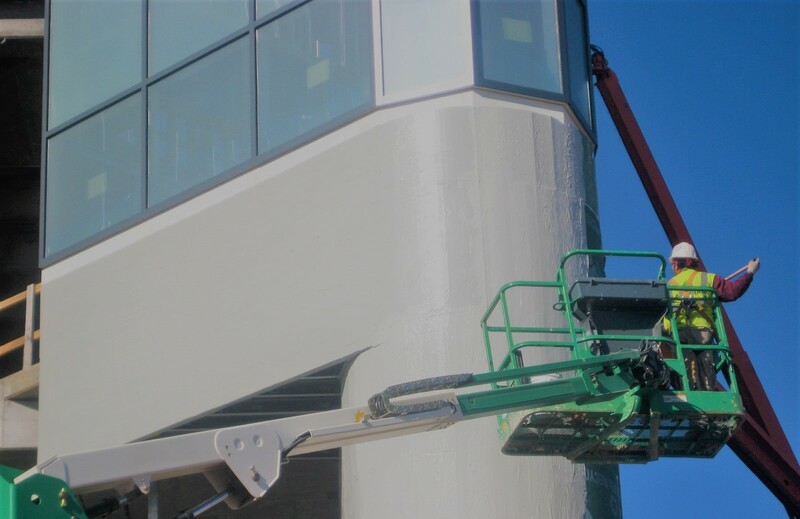 Moisture retention is exacerbated by construction methods when concrete is installed over nonremovable metal forms (or other impermeable substrates). While moisture generally does not damage the concrete itself, it typically migrates into the roofing system where it is absorbed by materials that are more sensitive. In recent years, the roofing industry has become increasingly aware of the problems caused by moisture in concrete decks that can migrate into the roofing system. Originally thought to only be a problem with LWSC, recent research raises concerns with moisture migration from normal concrete decks as well. 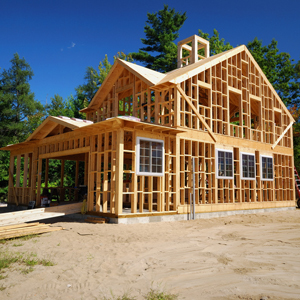 Shorter construction schedules and moisture-sensitive roof system components can aggravate the problem. Additionally, rewetting of exposed concrete decks adds additional moisture, raising the relative humidity (RH) of the concrete. As rewetting is a function of precipitation and drying rates of specific geographic locations, the project location matters. There is less rewetting and more drying in hot, arid areas like the Southwest; there is more rewetting and less drying in mild climates that experience even moderate amounts of precipitation. This latent moisture in concrete (from the mix water and rewetting) is of significant concern. While the sustainability movement is advancing the use of LWSC, the roofing industry is dealing with some of the material’s unintended consequences. Historically, most roof systems were adhered to concrete decks using hot asphalt applied in a continuous fashion, creating a monolithic membrane system. 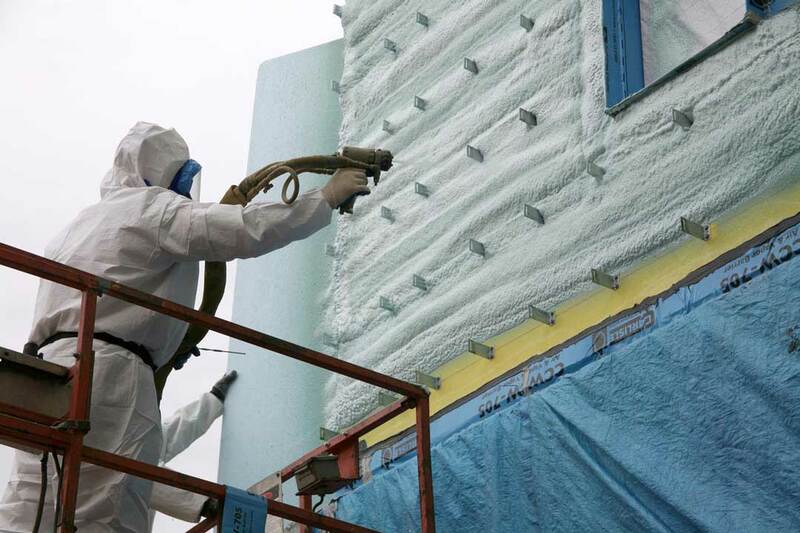 This inherently resulted in a vapor retarder between the concrete and the roof system, preventing moisture migration from the concrete into the roof system.